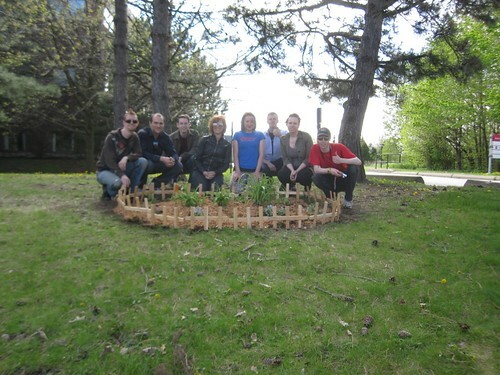 The first Guerilla Gardening planting of the year! It was way way in the North, up on the campus of York University, near a medical building - though don't ask me exactly where, I couldn't find it again on my own if I tried, that campus is so confusing! Ewan and I made those awesome fence pieces that you see, they really made this planting, it looks so cute! This garden is also showing the effect of the Awesome Grant - we were able to plant all perennials this time! So the little garden should last for several years rather than just being a flash in the pan like many previous efforts. I'm planning to refresh the same spot as last year for the downtown planting - hopefully with the base that we already have (all those lilies are still there!) we can expand to a much larger gardened area this year. And a little bit of that fence should go a long way there too!